White Chalk Paint Wax - formally known as Soft Wax - (500 ml) This is the largest tin available- meant if doing a couple of dressers. Used to give a pretty WHITE finish to your paintwork, bring out texture in brushwork and mouldings, as well as LIGHTEN and enrich colours. If used straight over Chalk Paint® - it will have a heavier white veil effect. 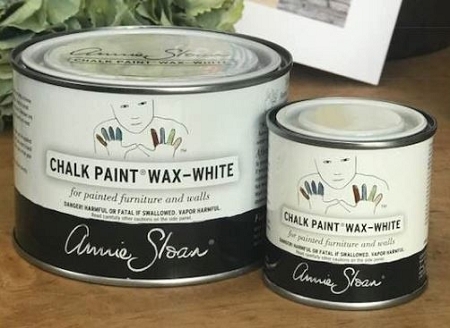 Annie Sloan White Chalk Paint® Wax can be applied directly onto wood to create a limed look, and it also has a wonderful effect on painted pieces. "Think of a piece which has been gracefully, subtly faded by sunlight - a piece left in a sunny spot, a terrace in Tuscany," says Annie. See Annie Sloan White Chalk Paint® Wax in use by clicking HERE. To age and give texture to your paint. Here is some additional information I would like to share in case you are wondering if you could use another type of wax- like Briwax. First- never use Briwax. It has an ingredient called Toluene in it. Which is awful! 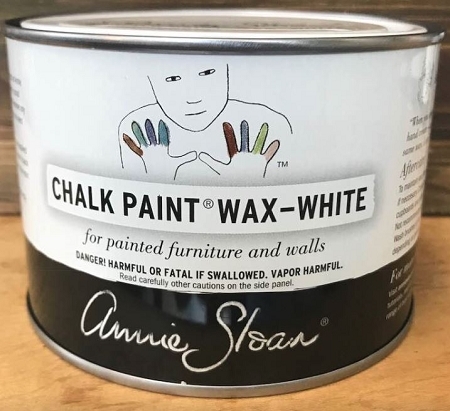 Briwax is terrible with Chalk Paint® decorative paint by Annie Sloan. Basically the toluene works as sort of paint stripper!